Cut a round piece of parchment paper to fit inside the cast iron pan. Allow the paper to come up the sides of the pan.This will make clean up a lot easier. Heat heavy cream in a small sauce pan over medium low heat. Do not leave the pan. It will boil in a minute or so. Stir it a bit as it heats. Remove the cream just before it boils. Pour the hot cream over the chocolate chips that are in a medium size bowl. Let it sit for 1 or 2 minutes. I know you want to stir it but let it sit. Okay, now you can stir until the chocolate and cream are thoroughly combined and creamy. Pour the chocolate mixture (ganache) into the parchment paper lined pan and spread the chocolate evenly in the pan with a spatula or spoon. 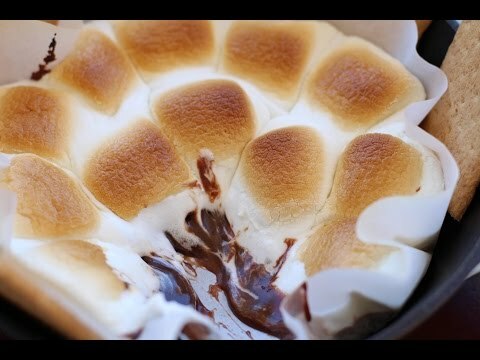 Top the chocolate with a single layer of marshmallows. Just set them on top. No you don't push them in. Bake in the middle of your oven for 7 to 9 minutes or until the marshmallows are golden brown just like when you roast them over a campfire. Pull them out of the oven and serve with graham crackers of course! Don't even try and serve them with carrots. Not gonna work. Feel free to double or triple the recipe if you are cooking for a crowd. Of course you would use a large cast iron pan for this or a large baking dish. That chocolate is going to stay nice and creamy soft, which is how I love it.